Just wondering if anyone else experiencing crashes recently, and whether there have been any changes to the IceTV data stream. My Topfield 2460 - which, to be honest, has a little history for crashing - has become almost unusable with crashes every 73 seconds. This seemed to come on today (13/4/16), with no other alterations to setup. After trying lots of things - factory resets included - turning off IceTV seems to have created stability. There is a second possibility; some people in Sydney were experiencing rebooting because of a 'naughty' character in the ABC EPG data. I understand it has now been fixed. Try clearing the EPG cache; in I've TV settings press red function key. Alternatively, delete all service (which will purge IceTV data) do a new scan and resend timers. Not quite so fast. I've just spent an hour and a half stuffing around with the 2460 [set for Brisbane] to get some form of it working again. Surely IceTV know what the 'illegal' character that is causing all the problem really is and can search and remove it in the time between when it arrives from the ABC/SBS and when it is released on the server. While I acknowledge that asking Topfield to fix the problem is the long term solution, there has to be a better work around than doing a factory reset! Surely IceTV know what the 'illegal' character that is causing all the problem really is and can search and remove it in the time between when it arrives from the ABC/SBS and when it is released on the server. The phantom illegal character was a wild goose chase because that was not the cause. The problem was the existing issue of Topfield PVRs not coping with the amount of guide data due to all of the extra new channels broadcasting now. The solution is to disable 1 or 2 channels in your account. Change them to "Disable" in the right-hand column. Unticking them in the left-hand column does nothing for PVRs. This assumes that the correct channels are already setup in the account. Regional customers will have twice as many channels as they need so should already have all of the city channels and extra channels disabled. You don't need to do a factory reset. Just clear the EPG by pressing the Red F1 button while in the IceTV menu. Topfield have labelled this button action as "Reset EPG Data" (in the button help at the bottom of the menu). Thanks Dave, I've tried deleting 31 and Food Network as well as reseting EPG. We'll see how we go. I would suppose the reality is that this will be an ongoing problem with Topfield PVRs as they are unlikely to be able to change the quantity of RAM (or whatever) installed to cope with the new Australian channels using a firmware update. The reality is that I would imagine over time there will be more channels released as well - not a consolidation. Is it time to consider replacing the Toppy with something that doesn't have restrictions on the memory? They can change the amount of ram allocated to EPG; they increased it for the TRF-5300 for the free-to-air EPG (or so Delta Mike Charlie told me). I was told by Topfield that this problem had been referred to the Engineers in Korea for a solution. No ETA on when one might be forthcoming. There is a update for another model promised for tomorrow, so we may be lucky and get one for the 7100+, 2400/2460 and 5300/5310/5320. I have six IceTV capable Toppys of various types and this is a very annoying issue. I've had a report of a 5300 freezing recently when using the free to air EPG. I have had issues with the 5300, but it was 'iced' and the problem seemed to be with the TMSTimer TAP; I suspect I had is misconfiguration. I am still investigating the cause. Its 20:00 on 20/4 and my Toppo 2460 had started rebooting again after a few days of it not doing it, have had to turn off ICEtv again. That would be because you have every channel enabled (including the now dead TVS). Unticking channels on the left does not disable them. That just stops them appearing in the TV guide on the website. 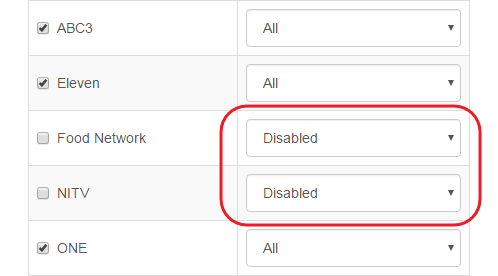 You need to set them to 'Disabled' on the right, in My Account > Guide Settings, as in the following image.